Who Is Eric Gordon, How Much Is He Worth, Is He Related To Aaron Gordon? One of the strengths of the human race is our creativity in problem-solving. Through our ability to fashion out of the box ideas, we’ve come up with solutions to things like unemployment via the creation of different kind of sports. With about 500 professional players in the NBA, which includes Eric Gordon, and an even larger number of supporting casts from broadcasters to stadium stewards, a lot have been given the means to cater to their personal needs. Speaking of the people who are benefiting from this creativity in thinking like Eric Gordon, he is not just taking a paycheck and going home while providing zero value, he is one of the best players in the NBA in his position – Shooting Guard. Alongside James Harden, Eric Gordon has become one of the pivotal players in the rise of the Houston Rockets. 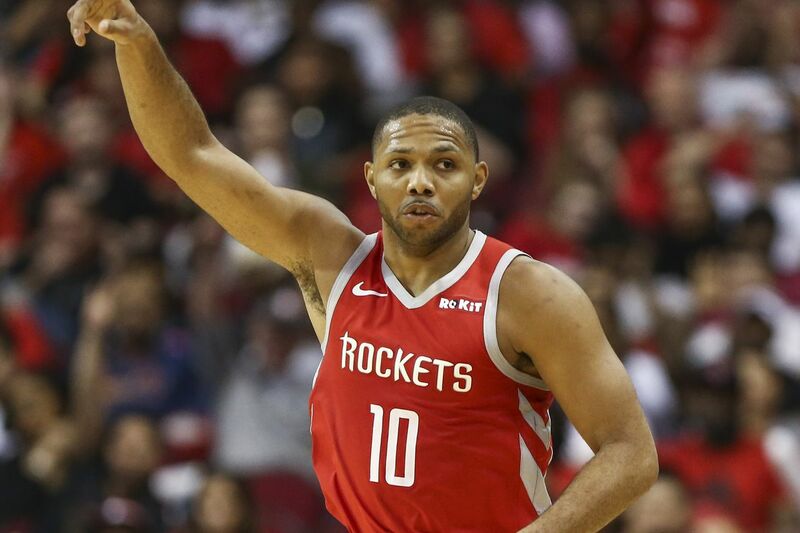 Eric Ambrose Gordon Jr. is the birth name of the Houston Rockets number 10 who is also one of the best players in the NBA. Gordon is a special man for a few reasons, one of which is the fact that he was born on Christmas Day in 1988 to Eric and Denise Gordon in Indianapolis, Indiana. He began his journey to the NBA in a Jewish Community Center where he would play basketball as a four-year-old. He continued to hone his skills all through his life as he proceeded to attend North Central High School, where his performances and talent caught the eye of arguably the greatest player in the history of the NBA, Michael Jordan, who attended one of his games. His high school career performances made him one of the hotly contested college recruits and he eventually signed for Indiana University Bloomington where he played just for a season before moving on to declare for the NBA Draft. Despite spending a season in college, Eric Gordon made several personal achievements, including being named in the second team All-American. After declaring for the 2008 NBA draft, he was selected as the seventh overall player by Los Angeles Clippers. Usually, one can be forgiven for poor performance in the first season in the NBA but Gordon was not one to deliver poor seasonal performances. He finished his first season with 16.1 points per game from 78 games. This helped him secure a top 5 position on the NBA Rookie of the Year voting list. Since breaking ground on his NBA career, Eric Gordon has played over 10 seasons in the league, featuring in over 500 games for teams like the Clippers, New Orleans Hornets, and the Houston Rockets. Over the course of his career, he has maintained a point average of 16.7 points per game and 3.1 assists per game. He has also started over 400 games. While Gordon has often fared well in the regular season personally, his teams haven’t always had as much luck and he has only been able to play in the playoffs just a little over 30 times, starting just less than 10 games. In his limited playoffs appearances, however, he has managed to record points average of 14.9 and 3.0 rebounds per game. Some of his individual accolades include winning the NBA Three-Point Contest in 2017 and winning the Sixth Man of the Year award in 2017. Since he joined the league in 2008, Eric Gordon has earned himself a ginormous amount of money for his performances on the court. He started with a salary of $5.44 million spread over two years for the Los Angeles Clippers but now earns $13.5 million per year after signing a $53 million contract with the Houston Rockets in July 2016. Before signing with the Rockets, Gordon signed a mega 4-year $58.4 million contract with the Hornets in July 2012 which has now all added up to a net worth estimated at $14 million when all taxes and commitments are factored. Is He related to Aaron Gordon? Two people sharing a surname is common, however, two people sharing a surnamed in a niche professional sport at the highest level in the NBA is not so common and thus often raise questions on if both parties are relatives. We can safely report that despite the similarity in profession and surname, Aaron Gordon is not related to Eric Gordon.